An authentic medieval setting for Mount & Blade based on the real 1257. Knights, real tournaments, authentic coats of arms, Vikings, Ancient Russians and a Crusading Order. The factions have been thoroughly remodelled and new graphics added, with an emphasis on quality. 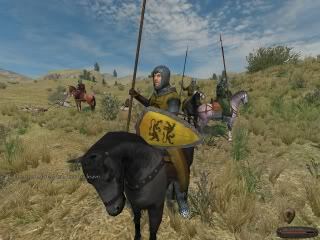 The 1257 Edition of Mount&Blade is a realism mod that grounds the game's original setting more firmly in the actual history of the native version's starting date: 1257 A.D. Mount & Blade offers realistic mounted combat with equipment drawn from the Middle Ages, but the original setting presents a hodge-podge of over 500 years of history, mixing Viking-Age segmented helmets with Renaissance plate armor. The 1257 Edition offers a more authentic experience. Originally released in the Summer of 2008 for the beta version of Mount & Blade, the mod has recently undergone an extensive update that makes it compatible with the full commercial release. According to Frederic_A, the developer: "Version 1.2 is what the mod was originally meant to be. There is a lot of new content here such as a more extensive and pure approach to heraldry and the knightly tournaments that makes this a more complete experience, and it benefits from the refined commercial build of M&B." In the 1257 Edition, the map remains essentially the same, but all the factions and equipment have been thoroughly remodelled, and new graphics have been added to create a world that feels very much like the mid-thirteenth century Baltic. Every faction is now based on an historic counterpart: The Vaegirs on the Ancient Russians, the Khergits on the Mongols, the Northmen on the Scandinavian kingdoms, and the Swadians on the Livonian and Teutonic Orders. The remodelling includes the most part of the banners, NPCs and even faction faces. "The philosophy here has been to concentrate on quality," says Frederic_A. "Rather than spend limited resources on a total rewrite with a thousand new items, care was taken to ensure that what goes in is done right, and that the Mount & Blade experience stays as true as possible to the mid-thirteenth century period within the game's original setting. The factions have been tweaked to resemble the historical powers of the Northern European / Baltic region, both because this seems to be what Calradia is mainly based on, and because I think it should make for interesting gameplay." Check out the mod's profile on MOD DB for a list of features and some screenshots. More images and information can be found on the mod's homepage (see profile). Character, whether starting as a vassal or independent, begins with -10's of millions debt (in red) on budget page. Wait to first payday and it just grows larger? What's up? what m&b is this mod for the first warband or with fire and sword? HELP! 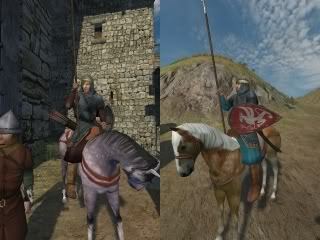 when i put my you know those two files to get my banner on my armour and horse i putted them when i open game the banner isnt on my horse even i checked if it is custom barbed horse everything is alright but the banner doesnt show up i pasted those two files in the mod's texture folder i dont know what to do?